New item River peak (River peak) Hurst Native 8 '6 "# 4 4 pieces Carbon rod RP - HU 8644 began selling. Please check here for detailed specs etc. The website has been renewal. We added various contents including product information. Thank you river peak. We opened a website. 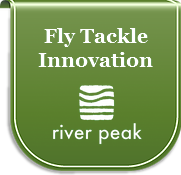 river peak aims to be a brand loved by everyone as a fly fishing tackle regardless of domestic and international. Best regard. Representative Director, Yuzuru Morimoto.